Citing sources familiar with the matter, The Information reports Apple is in the process of preparing content partners for the scheduled debut of a highly rumored streaming service. While an exact launch date is unknown, Apple has reportedly told companies tapped to air shows on the unannounced service to ready their offerings by mid-April. A formal launch is expected "within several weeks" of the mid-April deadline, the report said. The timeline is consistent with previous rumors that pegged Apple to unveil its streaming product in early 2019. 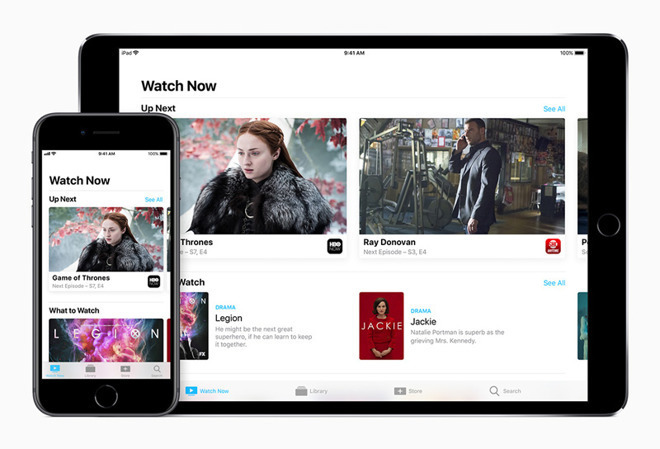 According to a report in November, Apple intends to release a slate of original movies, TV shows and other media through the TV app that comes pre-installed on iPhone, iPad and Apple TV. Owners of those devices will be able to access content for free as a type of value-added service. The TV app itself will be revamped as part of the rollout. Along with free-to-watch originals, Apple is planning to sell access to outside channels under a subscription model. It is these entertainment companies that are likely referenced by today's report. Third-party channels are only part of the story for Apple's homegrown streaming service. The tech giant is looking to expand on its existing lineup, which consists of "Carpool Karaoke" and "Planet of the Apps," with a billion-dollar original programming offensive. Reports continue to chronicle Apple's spending in the space, with the company now attached to shows involving big Hollywood names including M. Night Shyamalan, Kristen Wiig, J.J. Abrams and Reese Witherspoon. I do not see any benefit from Apple producing its own shows. We already have a ton of organizations who specialize in this. So what makes Apple think they can do it better? Apparently, they think that they can. But, so far, I have not seen any evidence to support the belief. The future is cloud services and content it's the only way Apple can keep charging extortionate prices for its phones, it has to provide plenty of free quality value add. This is why it needs to get airplay on as many TVs out there as possible to give this a chance. I don't think the growth will be that great to be honest and apple may have to spend it's billions on making iOS TVs in hope they can take on Samsung, LG and Sony but who wants to buy a walled garden TV and at a premium price. Can you stop with this crap? You want Apple technology and breakthrough innovations at android prices? Why doesn't anyone complain when android copies Apple pricing minus the innovation, software development and security? Apparently you haven't seen how much Samsung are charging for their phones. That was my point. Samsung phones aren't cheap either. And they don't innovate, use a 3rd party OS and don't put R&D into security. People are just dumb enough to think they're just as good as real iPhones. Apple may have tons of money but they are coming to the part really late and they don't have any big brands vs the likes of Disney and Warners with Marvel and DC and HBO and Star Wars. If I were Apple, I would back a dump truck full off money to CBS headquarters and try to buy Star Trek and The Twilight zone from them. That's exactly the kinds of brands Apple needs. Unfortunately for Apple, as long as CBS has hopes of survival, I doubt they'd sell. Well not doomed, but the future is definitely going towards the recurring-service business and that's why Apple is trying to compete with Netflix, as daffy as it would otherwise seem. Apple is far from doomed anyway you want to look at it. We don't know their motivation for getting involved in content -- but it's not because their products are doomed. It's not like Eddy Cue is sitting in a director's chair, or Tim Cook is getting behind a camera. They're not producing their own shows any more than Netflix or Amazon or Hulu are — they're partnering with studios who are making content for them and other providers in many if not most cases. True... But still, out of their element. But then, so was Steve at Pixar. Did you mean to write PC guys aren’t just going to walk in?